Posted in: Uncategorized. 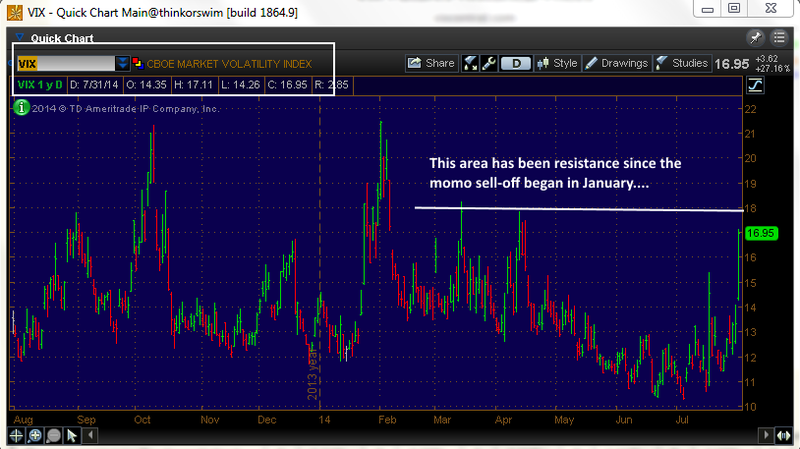 Tagged: Options, trading, VIX, Volatility. 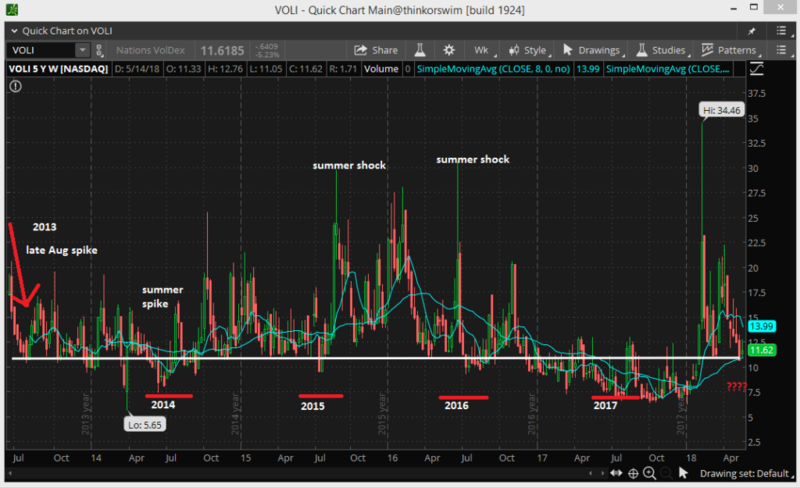 The question traders are asking themselves right now is if it’s time to concede long vol trades for a while and pack it in, buy some XIV and call it a summer. 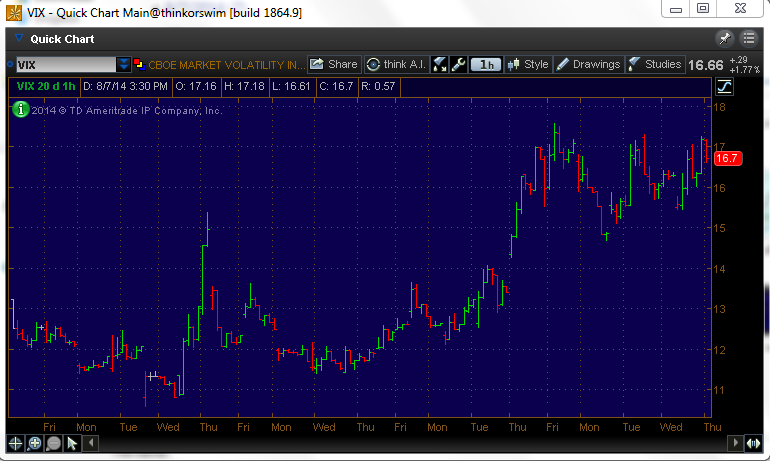 VOLI is the Voldex at-the-money implied volatility index. Basically, it’s a vix that measures 30-day implied volatility on options that are so close to price that they aren’t being used as insurance for tail risk events. For this reason, to me it can be more representative of the volatility environment. Short it and you can get ruined. Long it and you may bleed to death… but you could at any moment be lighting a cigar over tartare and delmonico while splurging on single malt islay. Back to reality. What is clear is that in the last 5 years, these red-lined areas (Late May to late August) are when volatility has been most likely to hit its nadir for the year. 2017 was a freak show, we all know that now. 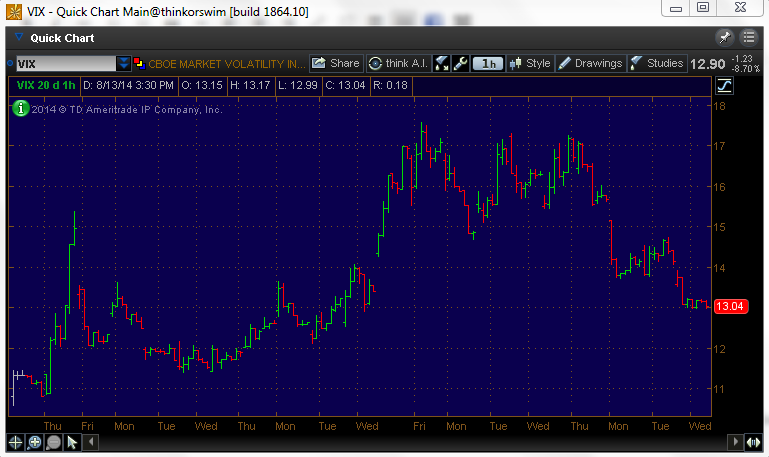 But spikes in at-the-money vol could easily hit serious levels, and these are low compared to the vix. The most likely time for volatility to absolutely crater is a week or so in front of July 4th, when the double whammy of the holiday and expectations for non-correlated market moves due to earnings weigh heavily. So don’t mail it in for the summer. 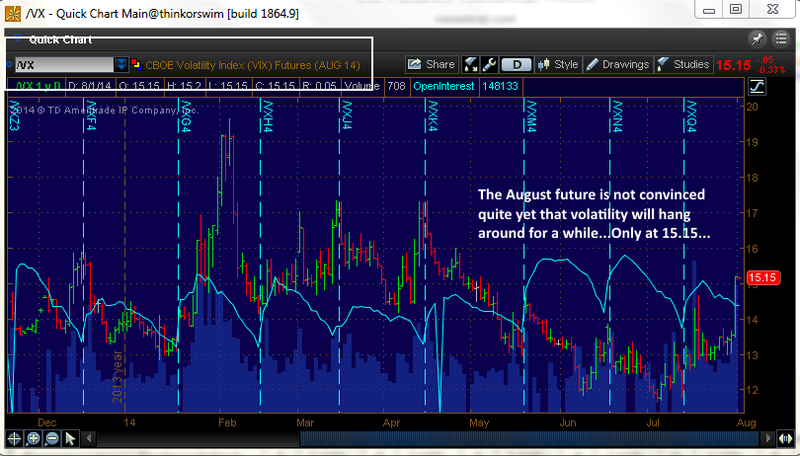 June, July and especially August frequently saw real vol spikes near volatility low points for the year. Keep your phone in the cart. Posted in: Uncategorized. 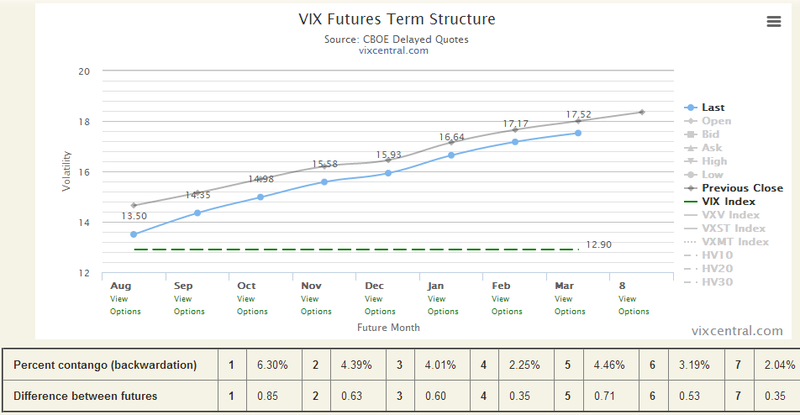 Tagged: calendar spreads, futures options, Options, ratio spreads, VIX, Volatility. When most folks think about trading volatility, they immediately look to VIX, VXX, UVXY, SVXY and all the exchange traded notes and funds that are not only misunderstood, but that also on occasion blow up accounts or seriously damage portfolios large and small. It’s not just retail (re: Target managers) that get caught in volatility storms, there are plenty of large traders that do inopportune things as well. Most of the problem stems from not doing simple homework of what the index or funds are tracking, but also following the herd, back-testing on a bias, and expecting the recent past to repeat infinitely. 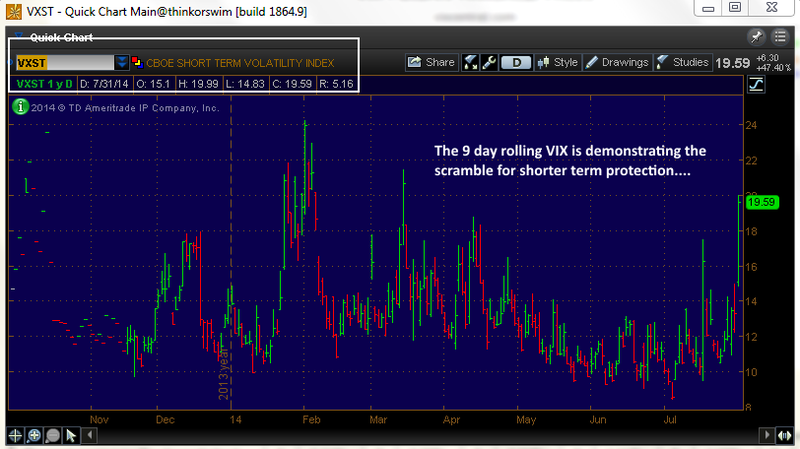 But trading volatility takes many forms, and you certainly don’t need to resort to those vehicles. Just going to the source of what the volatility derivatives are based on, SPX, can give you all that you need to extract some premium from the market with a risk/return profile that is probably better than dealing in the vix futures fund space. Let’s examine a structure that is rarely if ever found in the textbooks and is a short and long volatility trade combined. The volatility for this week was highest, a bit lower for May 25th, and lower for May 31st. Aiding this structure is the Memorial Day holiday. Looking a week out and stepping up the volatility by 2% from 14 to 22 (on May 23rd as shown in this chart), the profit and loss diagram looks relatively the same at all five 2% interval steps. That is the effect of owning longer dated puts, even though you are short twice as many shorter dated puts. The risk to this volatility assessment would be if backwardation were to become extreme, then the potential loss would be larger. You can’t have it all in a trade, there is going to be a way to lose. But the risk here is quite balanced relative to the return. 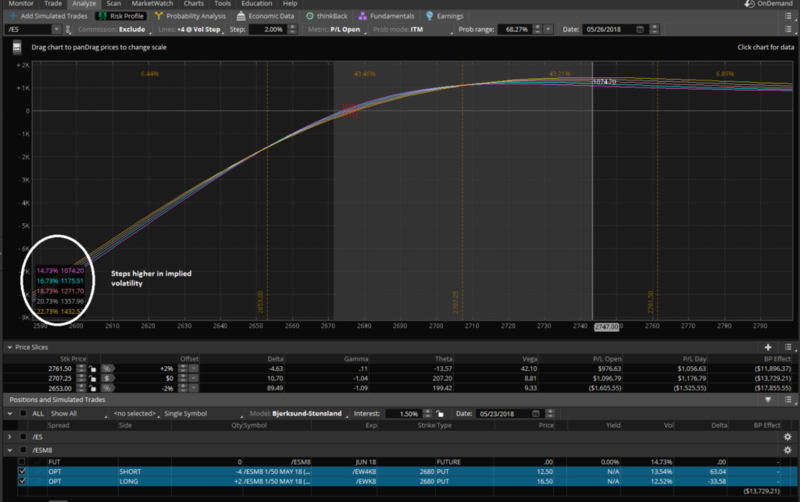 Doing this for trade with 4 contracts short and 2 contracts long yields an $800 credit, as the shorts were sold for $12.50 and the longs purchased for $16.50. Because of the structure, there are several paths to victory. A. The market could go up as far as it wants, you keep the $800. B. The market goes nowhere, you keep the $800 and sell the 2 remaining puts on May 25th for what they are worth, an additional credit. C. The market goes up and then on May 25th some quantitative tightening sends the market heading down and back to the original price of 2700ish. (Some is scheduled on May 25th, how fortunate.) 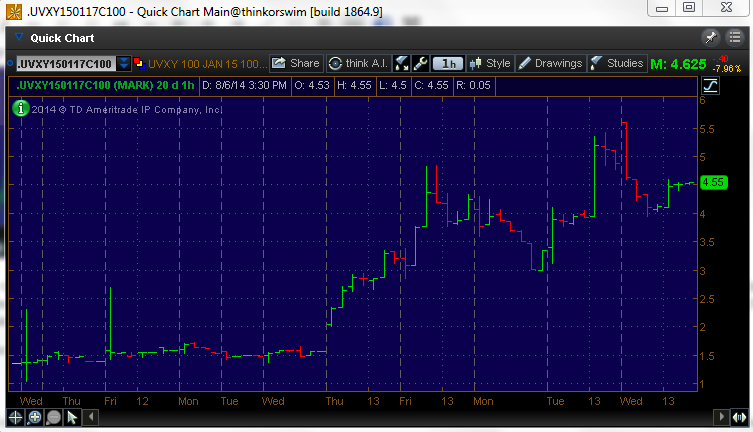 Implied volatility rises and you sell the remaining 2 puts for $10 or more. That would net you another $1200 on top of the $800 initial credit. In the last scenario, you are suddenly long volatility! You can be both long vol and short vol in the same trade and do absolutely nothing until you close it out. Posted in: Uncategorized. 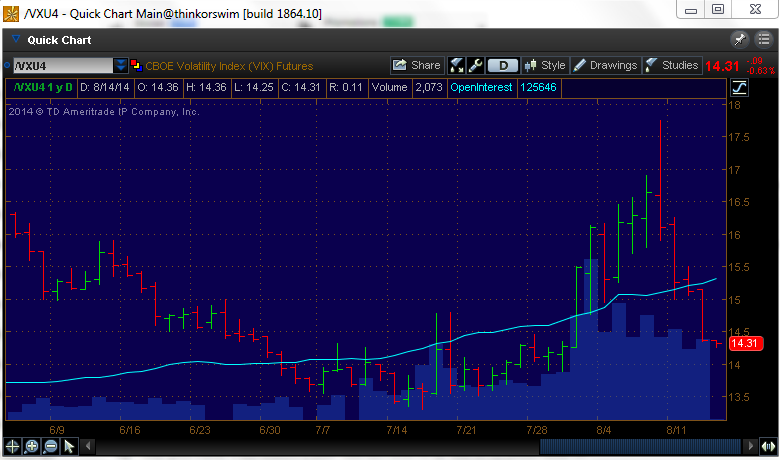 Tagged: nymo, VIX, Vix futures, volatility trading, VXX. The next two days I will be moving things around to prepare for the next cycle. (This week’s newsletter will be out tomorrow at around 10pm.) If the market wants to march higher in a straight line tomorrow, that will make things easier and offer the best prices. 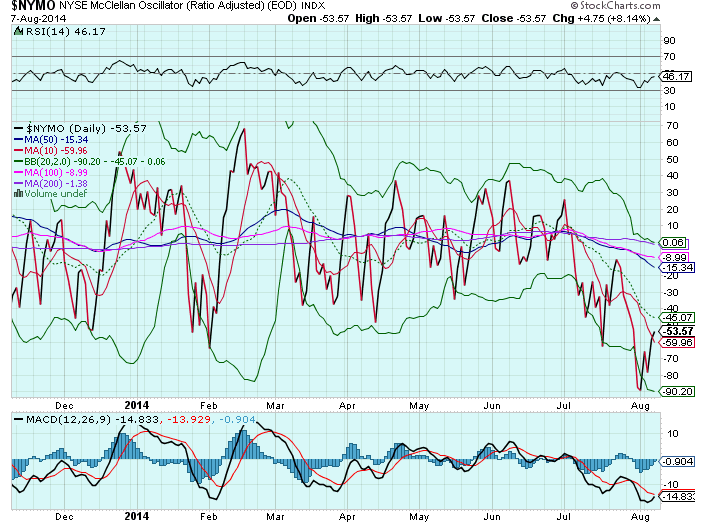 The NYMO is the black line plotted against the SPY. The high for the NYMO in 2014 was 68 in February (just before Feb’s VIX expiration, shocking), and while it does not portend of a drop in the S&P 500, it does usually mean that some sideways action is in order at a minimum. 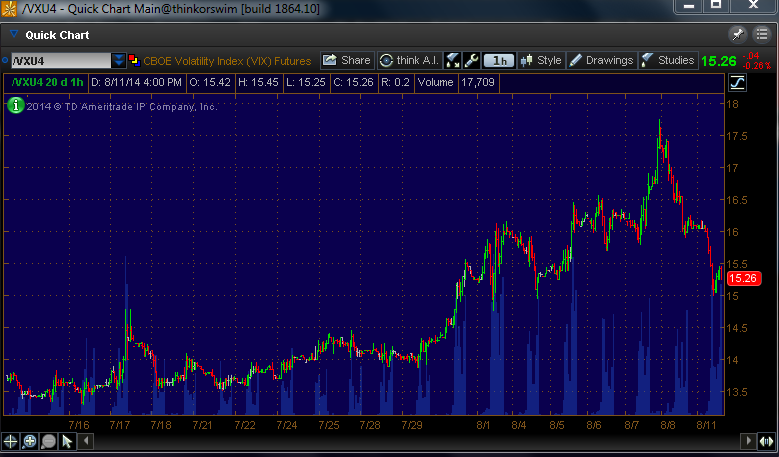 If the market does turn lower after Wednesday, it will be interesting what the media invents for a reason this time…. Posted in: Uncategorized. 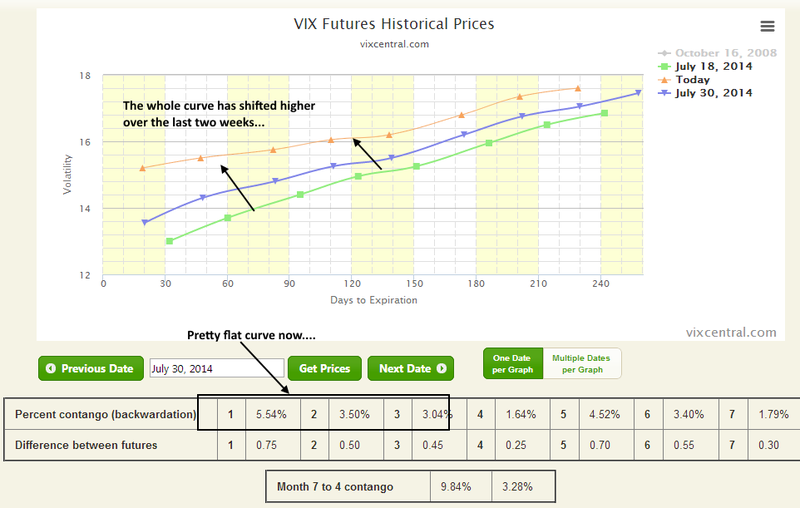 Tagged: VIX, Vix futures, VXX. This average daily return is .55%, as compared to .03% for all days since 1950. I will have more data going back a few more years soon. 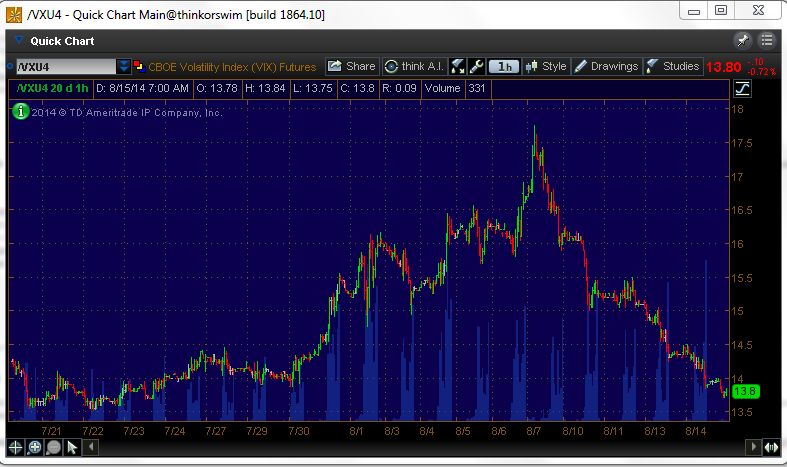 I’m eyeing Monday and Tuesday as the time to start some long vol positions. Posted in: Uncategorized. 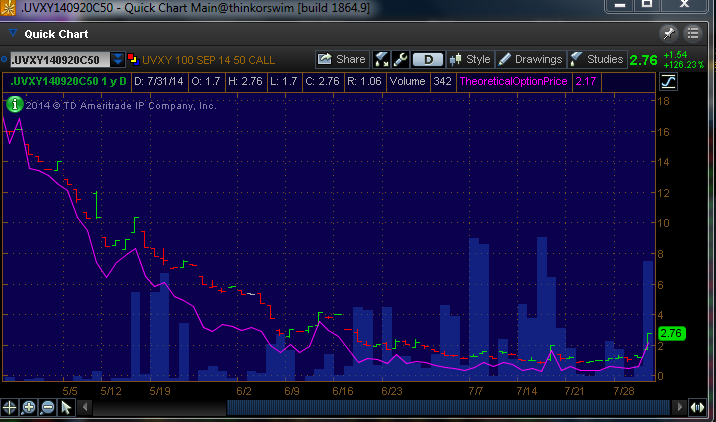 Tagged: uvxy, VIX, Volatility, volatility trading, VXX. In four trading days, the sentiment has gone from “the correction is finally here, the world is totally unstable”, to “the Fed can’t raise rates because the consumer is in trouble”. Is one of those supposed to be good news? Here is the truth: Retail sales rose 3.7% over last July. (month on month results are great headlines but miss the point) The economy is doing fine and nothing has changed. Meanwhile, historical patterns and typical 3rd week OPEX cycle volatility occurred, almost as if it was by script. So for the bulls, it appears to be all systems go for now. Our short positions on long vol have evaporated in a couple of days, and it is time to start looking at the other side of the coin. I started nibbling at selling premium on short volatility today, knowing that these bull moves can play out for a while. If nothing more, I’m establishing some hedges. The middle of August into OPEX and just beyond historically sets up bullish, so lets see if this year continues to play by the book. This week’s newsletter was published last night and the link to subscribe is above. Posted in: Uncategorized. 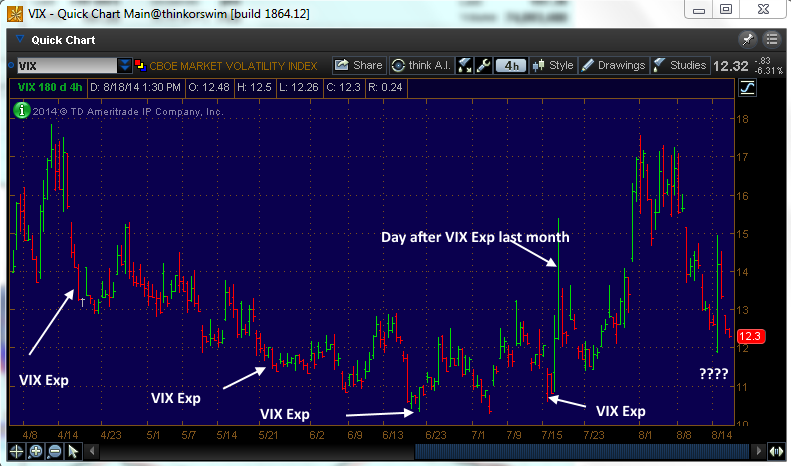 Tagged: VIX, VXX. Our next letter for subscribers will be published tomorrow night. 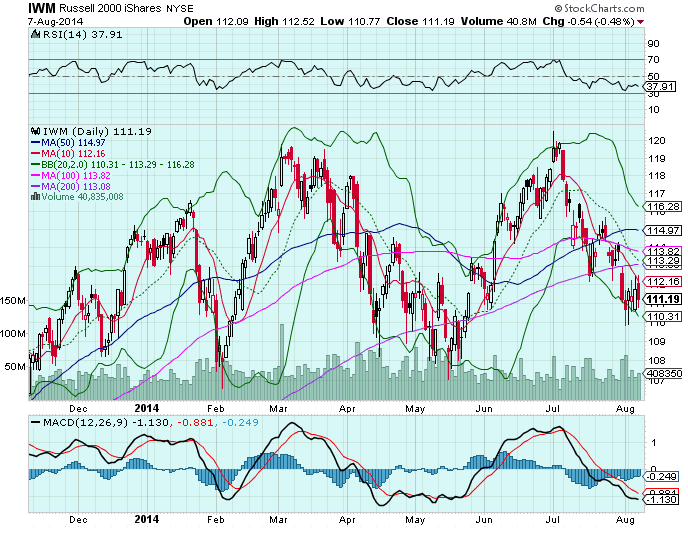 I anticipate a few new trades this week, and we are on quite a roll lately…. Click the link above to subscribe to the newsletter for $25/month. Trends are the name of the game to algos and a lot of traders, and today’s action was almost methodical in adhering to the short-term bearish trend that has been in place for nearly two weeks. August is living up to its reputation as the worst month for the indices since 1987, and every small bounce is being sold. 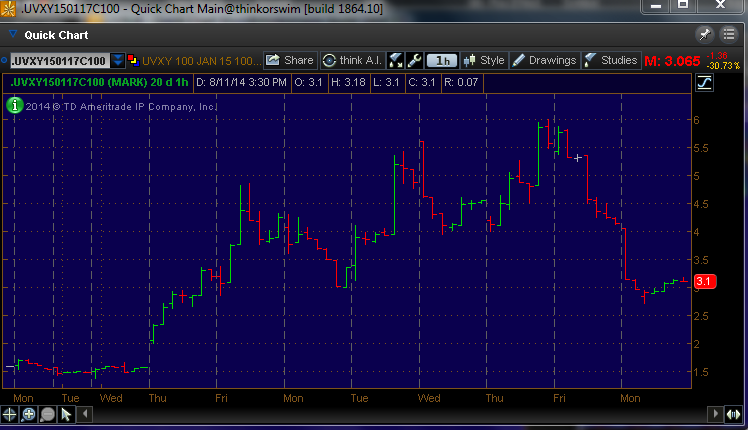 If you are a short-term trader, buying the VXX dips is working wonderfully. I’m not that type of trader, I like to think of shorting mispriced options as more of an investment. 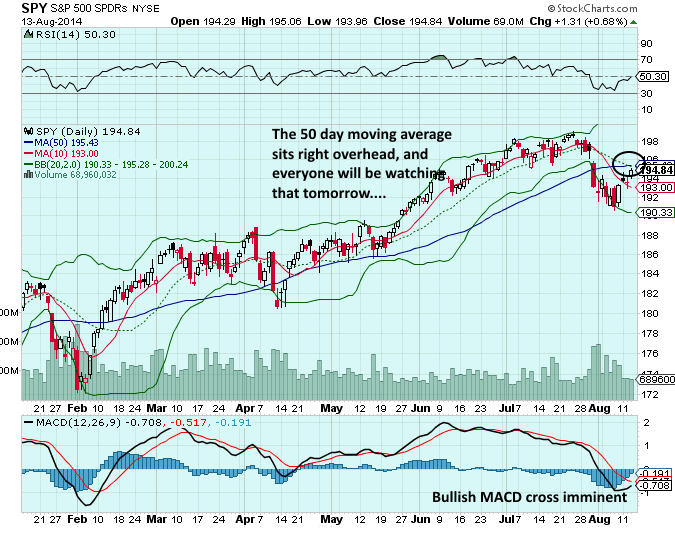 Wait patiently for good prices, then be a little contrarian in behavior with a longer-term view. 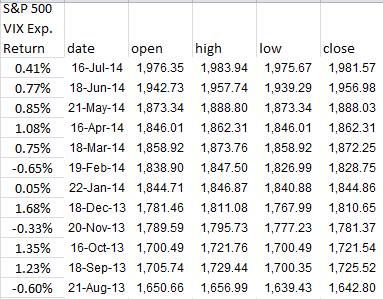 We are getting some nice prices now, if you can handle the how these options fluctuate in value in the short term. But realistically, the calls I’ve been selling have almost zero chance of being worth anything come expiration. There is no financial crisis looming like there was six year ago, central banks are far to accomodative, corporate earnings are too good, and economic data for the most part is just fine. What we are seeing in the markets is quite normal behavior. 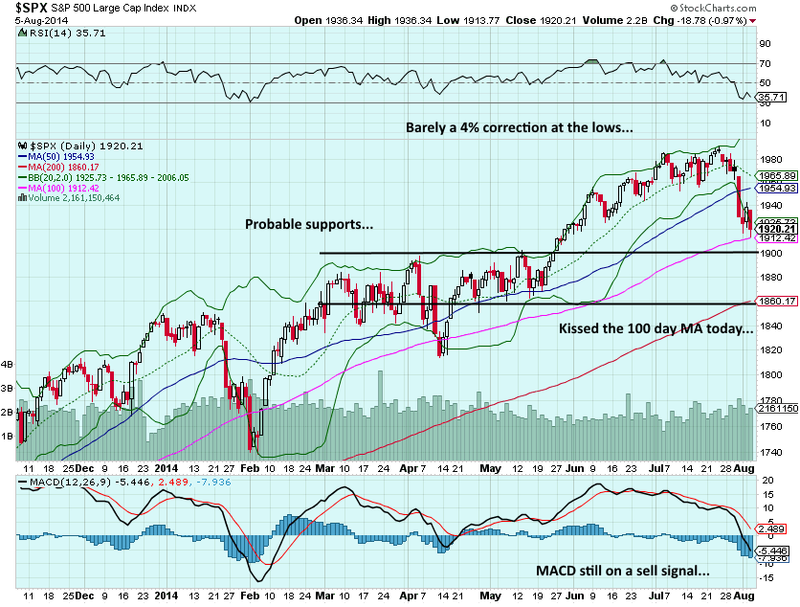 The bottom line is that we could have a washout and higher volatility, but we are due for a bounce. After the Polish minister news was blamed for the 15 handle S&P dip in 30 minutes yesterday, the DAX opened sharply lower boosting the VIX futures at around 3am. 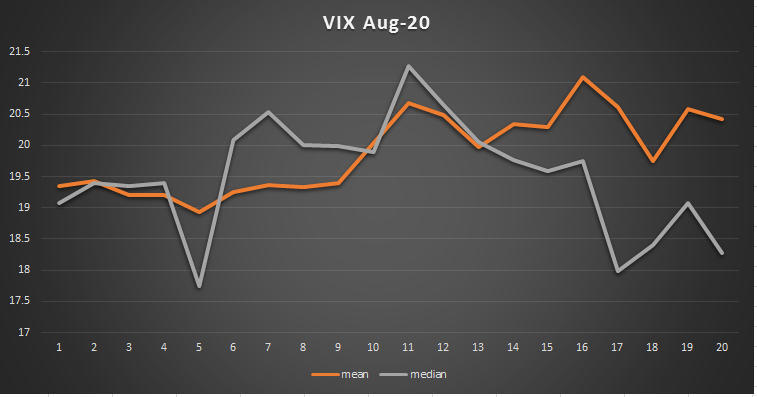 When the SPX bounced early, the VIX fell but as it was yesterday afternoon, selling reemerged to bring the VIX futures to unchanged. Mario, not unlike Helicopter Ben, is usually good for markets. 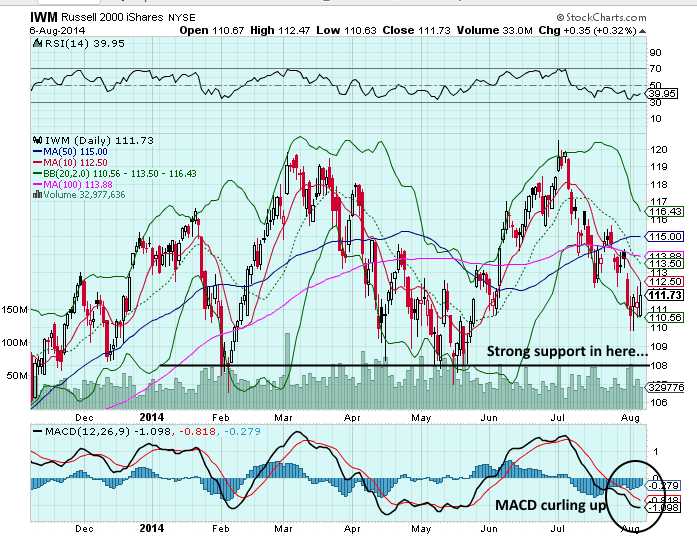 Already having instituted a negative rate window, now asset purchases are on the table. Should be an interesting day tomorrow. A couple more interesting charts: the Rut2k is finding a base and is now outperforming the S&P over the last few days, and the IYT Dow Transports are still beelining for the 100 day MA. 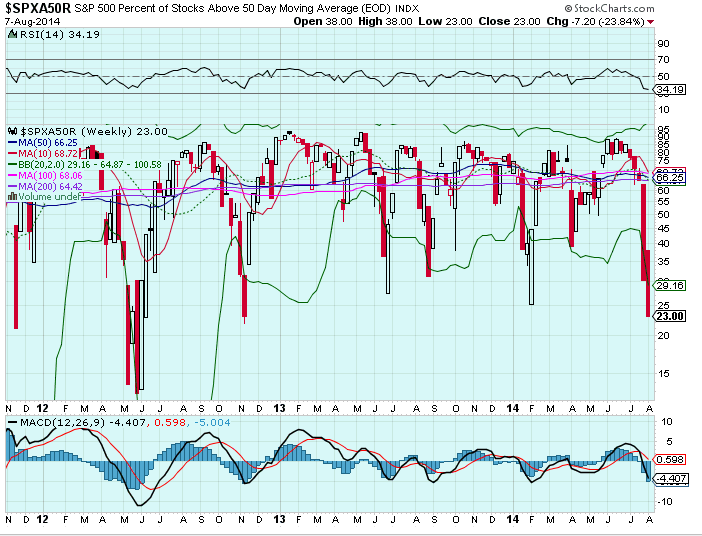 Incidentally the DOW is only 100 or so points from the 200 day moving average. 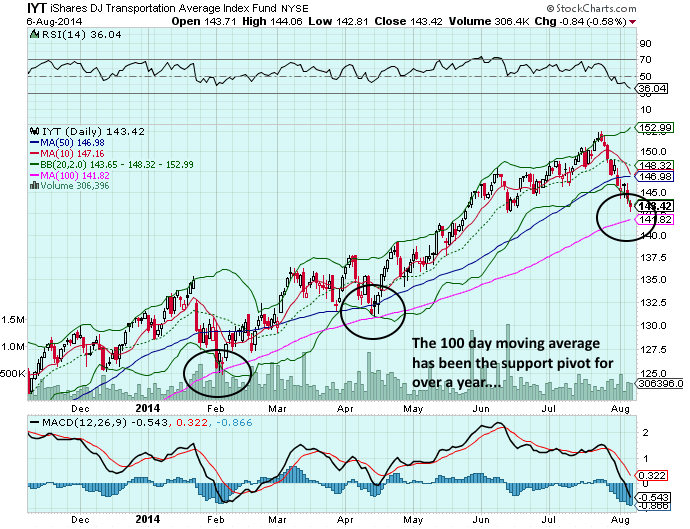 Economy Strengthens, Earnings Look Great and the VIX Surges – Why? 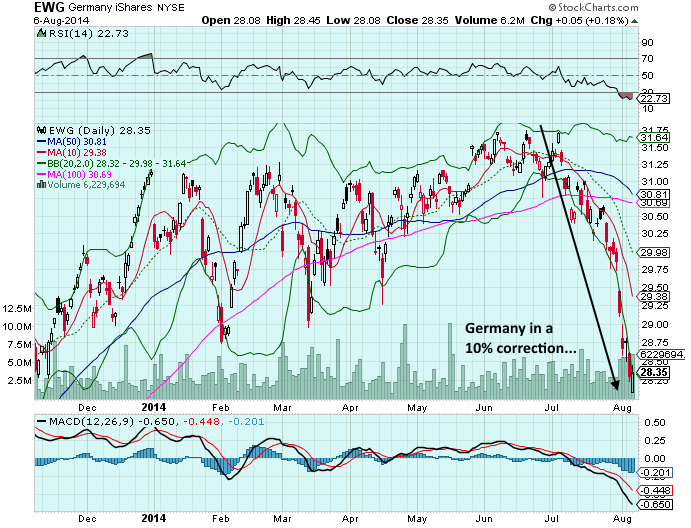 Pundits in the financial media are working overtime to explain a natural price action in equities. An old axiom by Jessie Livermore postulated that news follows price and that is what is happening these days, especially when ISM services came in at an all-time high (established in 2008, not a huge hurdle mind you), and S&P 500 corporate earnings are poised to grow 10% year-on-year. So the du jour explanation was an old story about more troops on the Ukrainian border. 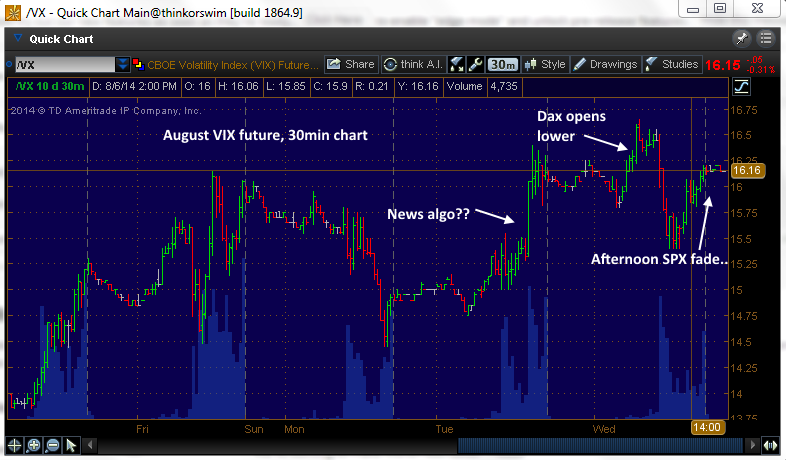 So maybe there was a runaway news algo at 1pm today, who really cares? These times are a gift, either for those looking for cheaper stock (re:Warren Buffett et al, he has a record cash horde) or for those looking to sell some expensive volatility premium. I fall into that camp of course, and these days are great. First some common sense, and then some data. Do you really think Russia wants to invade the Ukraine? Probably not. But if Mexico or Canada were in the midst of a civil war, would the U.S. move some of their otherwise idle troops into a nearby area in case something occurred? Of course. Secondly, if the Fed raises rates, is that such a bad thing? Ok, maybe the cost to buyback stock gets more expensive, but retirees get to spend more money via their less risky savings/treasuries investment returns, and banks can loan more money as their portfolios are less risky. (At higher rates, loan portfolios can handle more defaults, thus more lending.) Both of those are positive for economic growth, and thus corporate earnings. The financial sector is the S&P’s largest, and they would love to loan at higher rates instead of being a conduit for refis. Look at the KRE, the regional banking ETF, it is down 7% this year and that correlates almost perfectly with the rally in bonds. The small-cap index, the leader to the downside and the demonstrator of the breadth divergence we have been seeing lately, wanted to go positive today. It certainly appears that the selling in this area is nearly over. To subscribe to the weekly Volatility Analytics newsletter including real time trade alerts, click the link in the above menu. 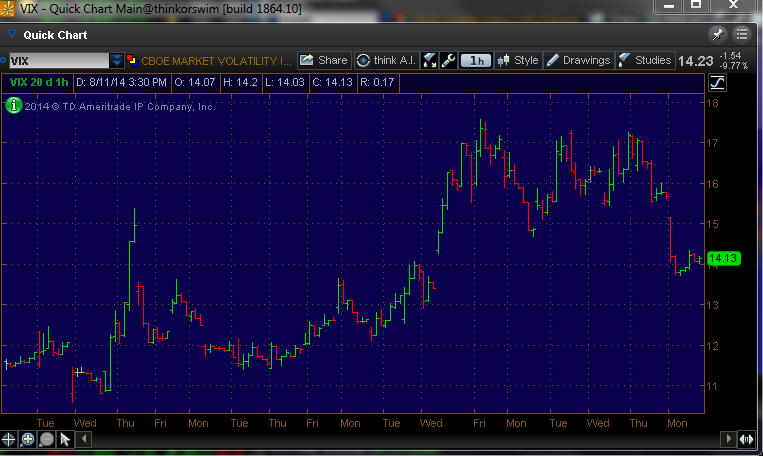 Today saw four month highs in the VIX, the S&P 500 gauge of implied volatility. Generally, sudden demand for puts and an absence of put sellers generates swift spikes up in the VIX, and today’s demand for puts was at a ratio of 2.6 to 1, with the largest percentage of puts being hit at the asking price. The punditry is scrambling for an explanation, and Argentinian default is a reach at best. 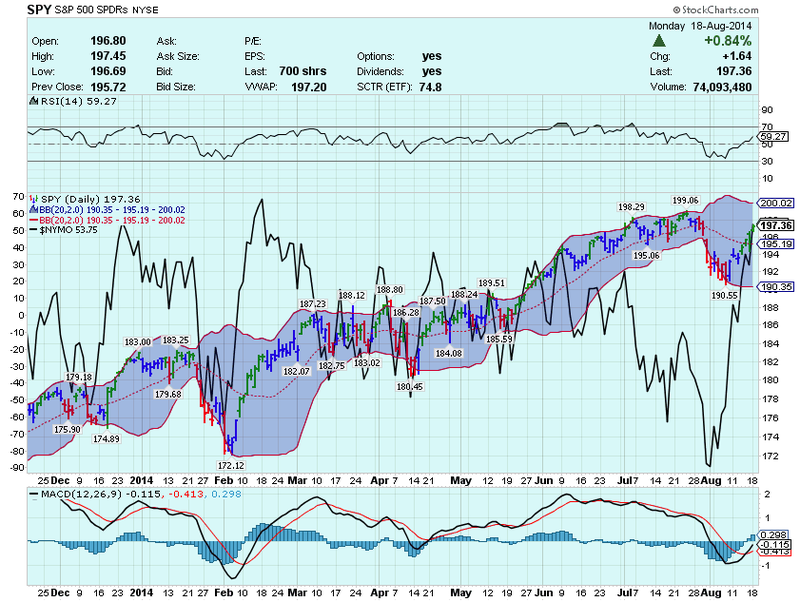 It appeared to me that the dip buyers finally dried up and gravity took over taking out the stops. 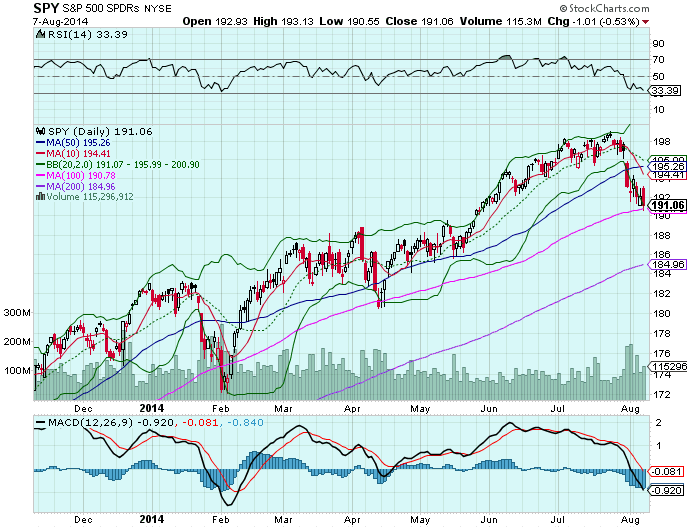 In reality, today’s not that big of a deal after months of methodically plodding higher. If you’re in the camp that this is just a temporary sell-off, then the VXX and UVXY offer some terrific ways to capitalize quickly on a fade in volatility, and I cover these every week in my subscriber newsletter. These ETFs can be tough to borrow to outright short, since the gig is up on these things as perennial value destroyers. I prefer to use the options as they are frequently mispriced, and that is exacerbated the farther out in time you go. This option has fallen from $20 to $2.76 in 3 months, and it was only $1 yesterday. For this option to be in the money, the August and September VIX futures (the current UVXY holdings) would have to rise another 30% and remain there until the third week of September. The odds of that are quite slim as the September future would have to sit above 20. 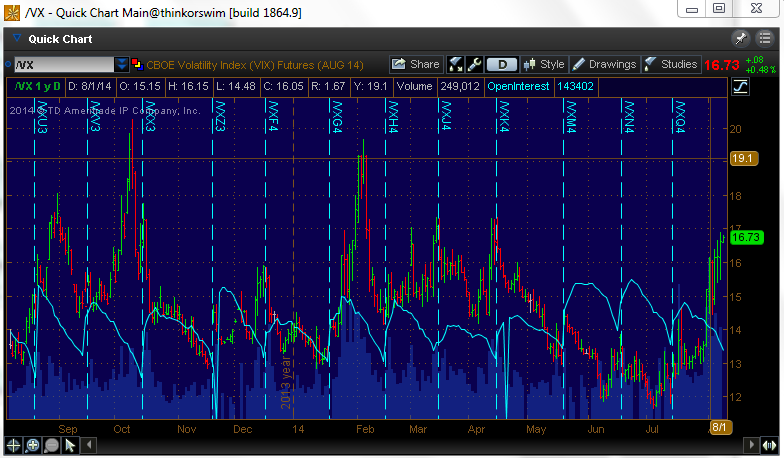 VIX futures have failed to sustain that price level for any significant amount of time since the spring of 2012. 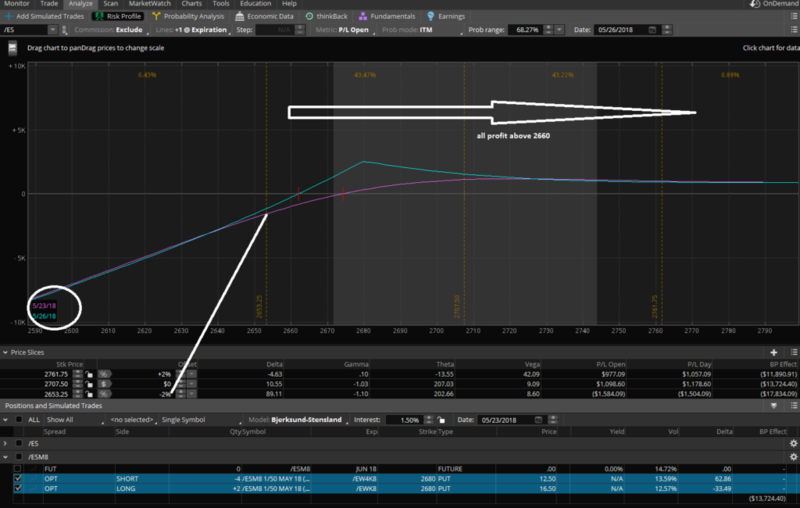 You can take a longer-term approach by selling the VXX January $40 call. 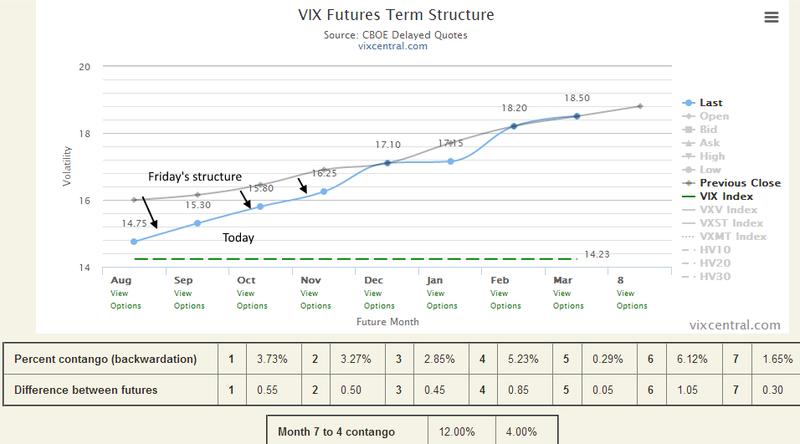 Again, you would need to see the effect of contango in the VXX disappear for stretches of time for that to happen, along with elevated futures prices. That option was up $1 today, so it wouldn’t be surprising to see that come back out of the price in a short period of time. 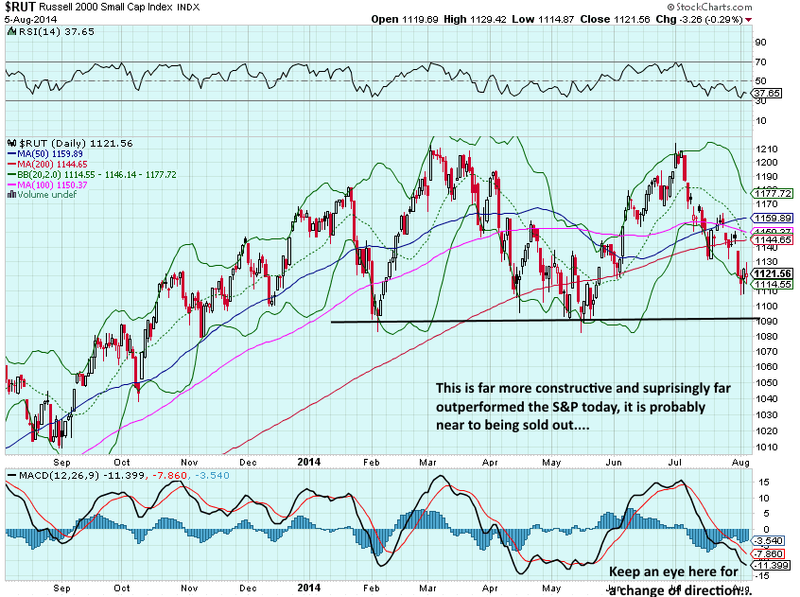 Look even farther out to January of 2016 if you want to sell some calls and do very little position maintenance. 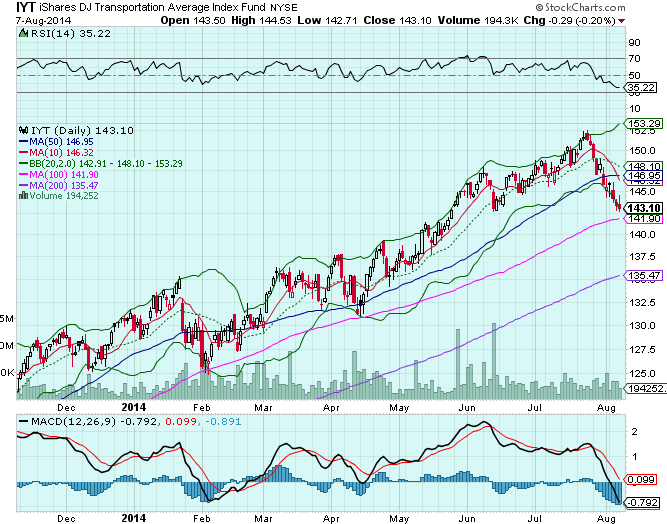 Of course, shorting these ETFs for the long haul will always work depending on your time frame. It’s only a matter of when, not if, the next reverse split arrives.